Just like her previous tirades and revelations, embattled star Claudine Barretto took to her Instagram account to post the order for an issuance of warrant of arrest for her estranged husband Raymart Santiago. The photo of the actual order posted on Sunday, May 25, clearly stated that "probable cause" was found against Raymart Santiago. "After a careful and judicious evaluation of the Resolution issued by the Investigating Prosecutor Primo Pagaduan Alonzo II, duly approve[d] by City Prosecutor Jason Antonio Amante, including the evidence presented in support thereof, the Court finds that there exists probable cause against the herein accused." The order further added, "Pursuant therefore, to Section 6 Rule 112 of the Revised Rules of Criminal Procedure, as amended, let a Warrant of Arrest be issued against accused, furnishing a copy thereof the Chief of Mandaluyong City Police Station, the Director of the National Bureau of Investigation, Taft Avenue, Manila; the Chief of the Criminal Investigation and Detection Group of the Philippine National Police, Camp Crame, Quezon City and the Chief of the National Capital Region Police Office, Camp Bagong Diwa, Bictuan, Taguig City." 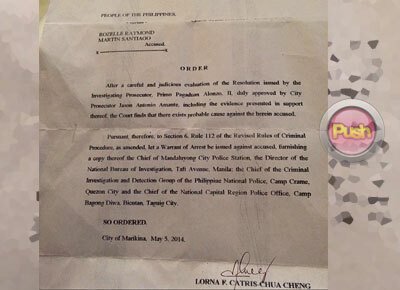 Dated "May 5, 2014", the order was issued in Marikina and was signed by a certain Lorna F. Catris-Chua Cheng. The mother of Santino and Sabina further wrote as a caption, "May this stop all abuses. God bless u all." The said post has over 505 likes and some 123 varied comments as of press time. Some lauded Claudine's "courage" and even encouraged her to for continue her legal battle, while others "disagreed" that she even posted the order underscoring that nothing good can ever be reaped from sowing grudge and exacting revenge. Last August, Claudine filed an Anti-Violence against Women and Their Children (VAWC) case against her estranged husband detailing "physical, sexual, psychological and economic abuse." While it's not clear if the warrant of arrest order is for the aforementioned case, earlier this month, Claudine also accused the actor of stealing a few pieces of her designer luggage as well as faking their marriage, twice.